I recently embarked on a journey that surprised quite a few people, myself included. What started out as an art project evolved into a series of questions that led in many directions, such as the process for the legal purchase of gun parts, the legal definition of a firearm, the difference between functioning and non-functioning gun parts, loopholes in international customs, the distinction between art materials and dangerous materials, and the gray zone of illegal activity. I arrived in Miami last December for a two-month stay at The Fountainhead Residency, curious to find some new direction for a project. The natural environment in South Florida was amazing, and my first impulse was to use it somehow as a subject. But as interesting as it was, I was ambivalent about nature themes dominating a project. So I tried to re-examine Miami through a fresh perspective every day, to see what else was there. 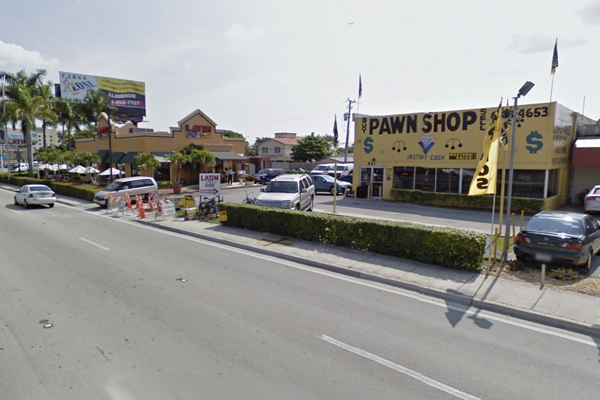 The idea to acquire real gun parts for an art project led me to visit pawn shops in Miami, including a big one near the airport. When I explained that I was a non-Florida resident trying to make a sculpture with gun parts, the typical response was a suspicious stare. But one employee was kind enough to direct me to Gunbroker.com. 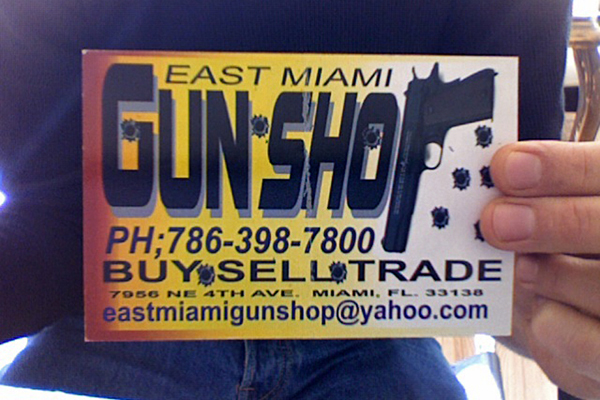 After a slightly complicated process (registering in Florida with a New York State Driver’s License bearing a Connecticut address) I was finally able to bid on real gun parts sold online. What shocked me was how easily parts could be purchased and delivered to almost any address in the United States, with little or no regard as to who was buying them. 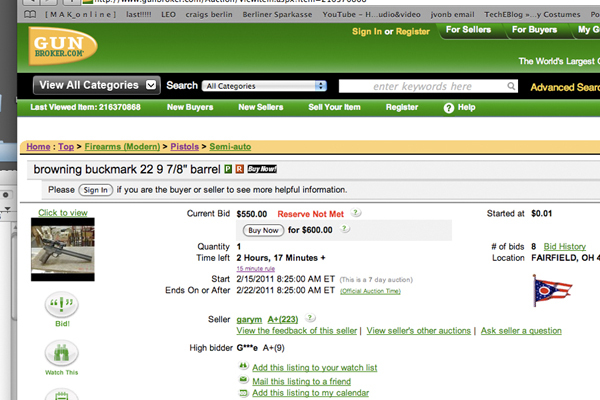 On Gunbroker, I won a barrel and a cylinder from a .357 Magnum (paid about $75 via PayPal). On eBay, I won a vintage toy water gun that looks identical to a .357 Magnum (paid about $7 via PayPal). 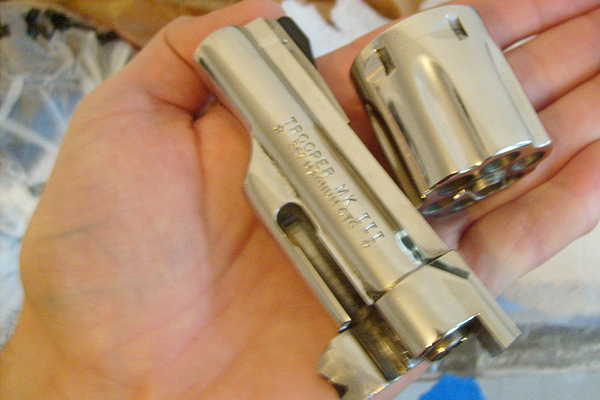 Also on eBay, I won vintage wooden grips for a .357 Magnum (paid about $50 via PayPal). 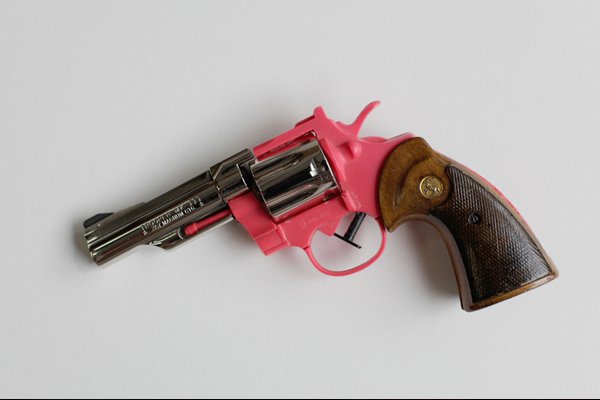 This completed the main parts of the sculpture: a hybrid of a real .357 Magnum with a water gun that was originally based on a .357 Magnum. Once I had the parts I made some slight modifications and was able to fit all of the pieces together. But the idea of finishing the sculpture and showing it in Berlin led me to the question of how to bring it there legally. To be on the safe side, I ground off parts of the metal pieces to remove serial numbers, and to create some “damage” that would not interfere with the aesthetic of the artwork. I also contacted my lawyer in Germany about all of this, asking her if she could research things on that end. 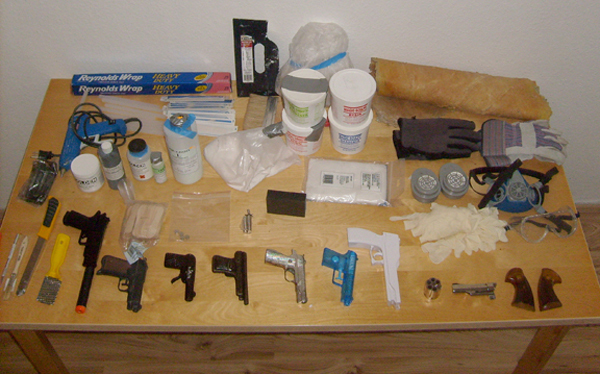 As I was about to leave Miami I decided to disassemble the parts of this new gun-sculpture and pack them next to all sorts of tools and materials I had been using along with unaltered toy guns (other water models, B.B., cap, video-game, etc.). My luggage was checked in and I had about a two-hour wait before boarding. An hour before departure I was hanging out at the gate when two men in suits approached the counter and grabbed the mic of a loud-speaker. I already had a feeling that they were airport security, and that this was about me. “Mr. John van Berger please approach gate 21.” Ignoring the mispronunciation of my name, I walked over and introduced myself. As one politely asked for my passport, the other just stared at me blankly. I simply said with a smile, “Yeah, I know what this is about.” The official with my passport said, “OK. 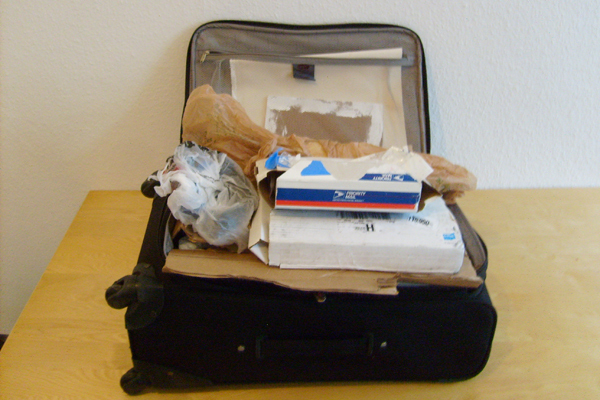 What’s going on with your suitcase?” I calmly explained I was a professional artist, transporting materials for a project. “Why do you have batteries in a plastic bag? How come your gun parts look concealed? You know, all we’d need to see is a wire connecting it all and you’d probably be in handcuffs right now!” and so on. They lectured me on how I should pack my suitcase, and the importance of declaring the gun parts when checking in. I basically got a slap on the wrist, and nothing was removed from my luggage. But in the end the security guys were actually quite friendly, and wished me a safe flight. With a three-day layover in New York I had time to decide if I would proceed to bring everything to Berlin as planned, or if it was as reckless an idea as all my family and friends believed. My lawyer had checked with the Beschussamt and other customs authorities in Germany to find out the legal end of things. She emailed me, “don’t even try it,” and explained that it was definitely not allowed, regardless of the fact that the gun parts were to be used for an artwork. To do this by the book would be a complete headache, not to mention expensive. 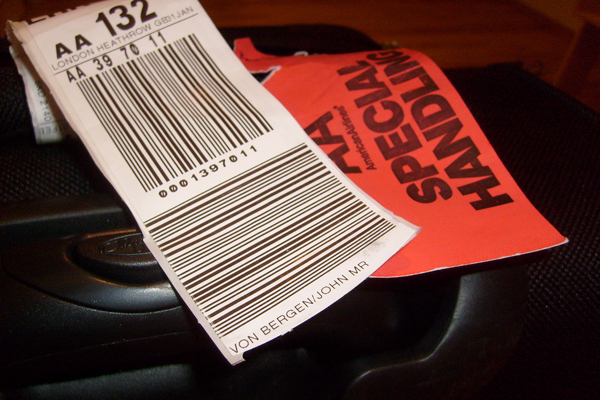 But after calling my airline, The Transportation Security Administration (T.S.A. ), and Port Authority Police, I realized there was no law against what I was doing in the U.S., and that no one would need to see any documents, as the U.S. officials apparently had nothing to do with customs or international laws. What was important was declaring any firearm parts at the time of check-in. I concluded that if there was nothing hidden, it could be worth a try. 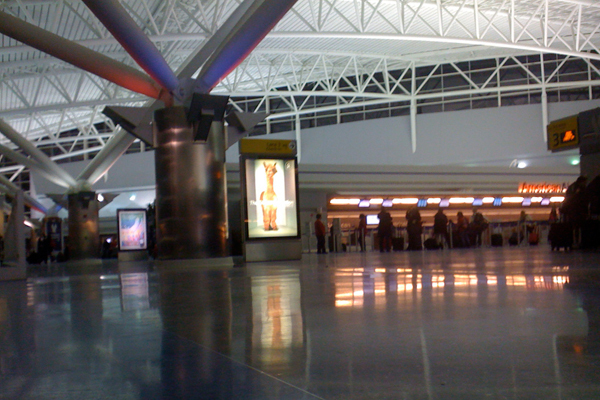 I prepared for the first leg of my journey to Europe by getting to the airport four hours before departure. After waiting in line I approached the airline representative and calmly said, “Hi, could you please contact T.S.A. and Port Authority Police, as I have gun parts in my luggage that need to be inspected.” He stared at me a bit confused, as did the representative standing next to him, as did the passenger standing next to her. I explained again, in more detail, that the gun parts were part of a sculpture, which was probably more confusing. He jotted down notes, then made a call. Some minutes later a young, heavyset police officer walked over, and I explained that I had damaged gun parts in my luggage that were to be used for a sculpture. He nonchalantly inspected the parts and handed me a small paper to sign. As he walked away a T.S.A. employee suddenly appeared and wanted to inspect the rest of the suitcase. Meanwhile a long line of passengers stood watching the whole episode, perhaps amused, perhaps concerned. Eventually the suitcase was taken away for further T.S.A. inspection, as their biggest fear was that some of the art materials could be flammable. I felt like I was creating a real headache for everyone around me, but somehow it was all calm and cool, never a moment of any real drama or serious tension. 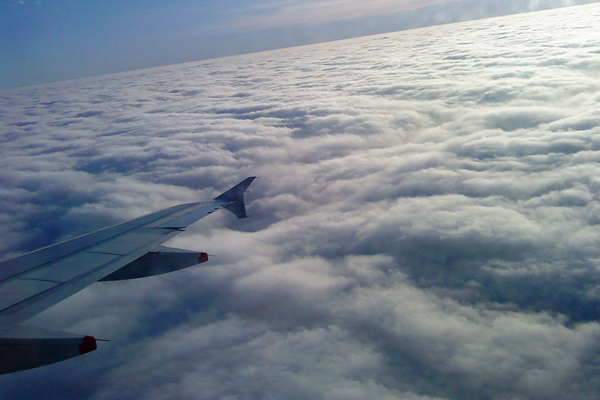 My three-hour layover in London was also pretty much drama-free. Just before boarding I checked at the gate to see if all was OK with my luggage. They informed me that one suitcase had been pulled by security. For a minute I was worried that the British sensed something amiss, but it turned out that all of my baggage would be safely accompanying me to Berlin. Eventually my luggage and I were escorted to the customs office where, after a few minutes of discussion among all of the agents, a head officer made the decision to let me keep it all; no papers, no fees, no arrest. They just handed everything back to me with a friendly Auf Wiedersehen. On my way home in the taxi a feeling of relief slowly settled in. But I also felt a slight disturbance at how easy, in the end, it was to get away with all of this. This essay was originally published on ArtSlant. Images by John von Bergen.